It’s been said many times, many ways…So wait, I’ll sing it to you! Acoustic trio “The Christmas Song” a.k.a “Chestnuts Roasting on an Open Fire.” In gratitude for a wonderful year of music, teamwork, laughter, joy on and off the road, and fantastic folkie bluegrass folks like you. God bless! Holiday spirit moved us Friday. We loved our beautiful Columbus, OH audience. Thanks to Six String Concerts for presenting this folky grassy trio! 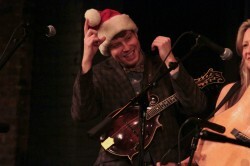 Glad we were able to add Christmas music to our bag of bluegrass, jazz swing, honky tonk, old time and folk music. We even got Robert to pull out the ol’ fiddle! Thanks Joel Stein for the great pics. See ya down the road, Ohio!